I spotted the PS Master Eye palette in Penneys yesterday in store and couldn't get over the resemblance it had to my much loved MAC Warm Palette. For €8 it was definitely much cheaper compared to €59.50 (I paid €75 as it later got reduced when their prices changed) but would the pigments in the Primark eyeshadow palette be just as good as its higher brand competitor? I had to buy it to see for myself. Both eyeshadow palettes have very similar packaging but the colours are what stands out the most as they are almost identical (bar just a couple). Besides the price, the other difference is the PS palette has 12 eyeshadow pans compared to 15 in the MAC palette. Once I started swatching the colours of the two brands with the eyeshadows I thought were most alike, they applied the exact same. The pigment was fantastic in both. Can you get over how identical they are?? I'm was so happy with my dupe makeup find and how pigmented the colours turned out to be in comparison, I decided to undertake a real test. I created the same look on both eyes, but using the PS products on the left and Mac on the right.... Could you tell the difference? 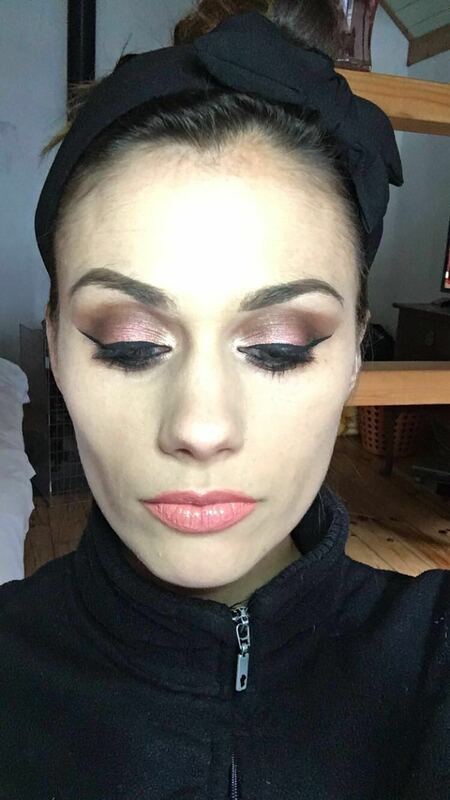 So this makeup look is very affordable, if you use the PS Palette! I'll be keeping this for my own personal use and still use MAC in my professional work though. Hope you enjoyed it, and please let me know of any finds of your own... I do love a bargain!! Hey there ! I got this palette a few weeks ago in my local Primark (I live near Paris) and I was just sooo happy... Cool thing with Primark (not all the time though hehe) is that many people open the products so you can just come and swatch things shamelessly, so cool ! - Primark's PS... Lipliners - £1. Amazing. Some say they're dupes to higher-end lipliners. By higher-end they mostly mean MAC. Ive got about 20 and the Red one (also called Scarlett) seems like a good dupe to Russian Red. They're so creamy, so longlasting and matte, OMG you can't miss that for the world. - MUA's Undress your skin powder highlighters with the wave design on it. OMG products. Even better wet. £3 also. - New Look's Super Matte Liquid Lipstick - I know they cost €8 here in France, I think it's about £6 in the UK. OMG Liquid matte lippies. SOOO comfy, I think I've never used matte lipsticks this comfortable. - Last but not least, Makeup Revolution's Vivid Baked Highlighters - shades Golden Lights and Pink Lights. Rose Gold Lights is more of a blush or a highlighter for darker skin tones. But OMG. Mine are so used up. Some of the best there is and they cost €4. I love these palette. Thank you for sharing.